We thought last week's minor kerfluffle, on Bobby Valentine's game of employment chicken, would be the last Red Sox update we'd have to do this season. No sense piling on. But the Red Sox can't seem to stop doing terrible things. This was sort of lost in the fact that the Yankees homered four times in a single inning last night, as Boston failed miserably at playing AL East spoiler, but New York was the beneficiary of a homer that maybe shouldn't have been. A fly to right-center off the bat of Russell Martin appeared headed for—and this is my best guess—the front edge of the top of the wall. 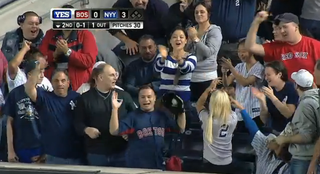 But a fan in the front row, wearing a Dustin Pedroia jersey, leaned over to try and snag the ball in his cap. It hit his wrists, rolled up his arm, bounced off his chest and back towards the field, where he finally corralled it. Bobby Valentine appeared bemused, but then he always does. Perhaps in another universe where that play and this game mattered, this is a big controversy today. Instead the Boston papers are consumed with getting in their last few shots at the surely departing manager. The topic of discussion: the quadruple-A lineup Bobby V ran out there. That's nearly $150 million worth of 2012 payroll pitted against a shabby starting Sox nine - Pedro Ciriaco, Daniel Nava, Ross, Mauro Gomez, Ryan Lavarnway, Saltalamacchia, Danny Valencia, Che-Hsuan Lin and Iglesias - making barely $12 million. Yes, it's not about the money. But if it's about baseball and trying to win games, this was an embarrassment. To maintain some standard of professionalism, Major League Baseball requires teams start at least four "regular players" for games played during spring training. Managers who flout that standard usually receive a note reminding them of the need to make the product presentable for fans. No such rule exists during the regular season, so Red Sox manager Bobby Valentine was free to use the nine players he sent up against the Yankees on Monday night. We are not ashamed to admit this at all: We will miss having Bobby Valentine in our lives when he's gone and no American team will go near him. I think the Boston writers will miss him too.